Ice hockey has Canadian origins but was institutionalized by the Old Continent. Surprise, surprise! This flat country was a part of it! Without a big ice sports tradition, Belgium was, along with France, Switzerland, and Great Britain, a founding member of the international federation in 1908. History doesn’t stop there. Twelve years later in 1920, the first Olympic tournament for ice hockey took place in Antwerp, Belgium! While the Winter Games did not yet exist, the tournament took place a couple of months before the official opening of the summer Olympic Games. The Olympic tournament is still the biggest competition for the discipline today, even if across the Atlantic, the NHL championships and the Stanley Cup are the most coveted titles. Since no club took over the shut down Brussels Royal IHSC, hockey players in Brussels have to go to the periphery. The most competitive can head to the land of the Chiefs in Leuven. Others will become either a Lion in Liedekerke or an Ice Warrior in Mechelen. All information can be found on the federation’s site. Our introduction to the joys of ice skating was guided by Tim Lannan. 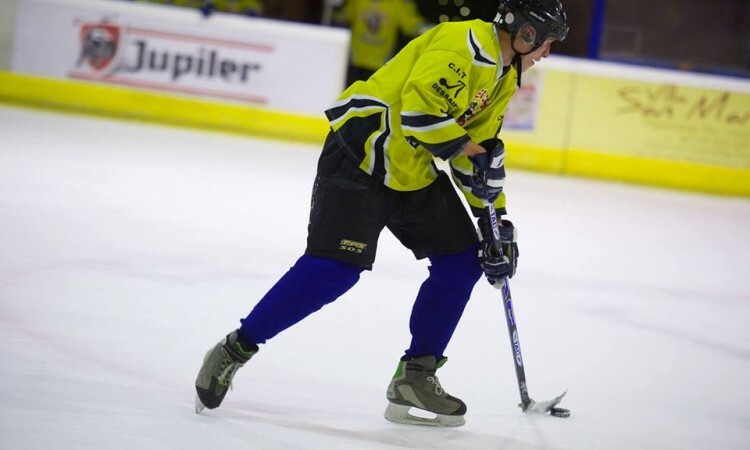 This Canadian ice skater oversees the young teams at the Leuven Chiefs: the perfect person for us beginners! At this point, I wasn’t regretting my recent skating outings in Brussels that helped me have somewhat of a credible appearance… With a little explanation and advice, I started to figure it out. Once in the pack, I reached my limits. The reputation of the fastest group sport in the world is not a lie… I was often left behind. The puck was no longer in my range of vision, I couldn’t seem to change direction quick enough… Basically, I was skating around the rink trying from time to time to participate in the action. As the game goes on, I learned some new techniques. Passing the puck along the wall became my favorite. I tried making contact with my opponent several times, all of which ended with me laying flat on the ice. At the end of three periods of 20 minutes, I felt like I had just exited a sauna… Exhausted, but happy! Good news, the ice rink in Leuven welcomes groups to try out ice hockey every Sunday in late afternoon. More information at www.ijsbaanleuven.be.